The Sea, is a graphite drawing (4.5 x 12) done on Strathmore Bristol Vellum using 4H, 2H, HB, B and 2B and loose graphite powder. A tortilium was used to blend and spread the graphite, then it was partly erased and then back to laying down more graphite until it reach enough coverage as well as the correct value ranges for each area within the scene. These layers help build the water and foamy spray to a sufficient level allowing several value levels to develop (deep and shallow water), as well as making the spray and foam highlights pop. Once done I went back in with very sharp pencils 4H and 2H to develop a richness with the background water. The reference shot was in color and the original scene larger, so I cropped it for a close-up of the wave and drew it in graphite – both changed the look totally. At some point I may draw this scene in a larger size, but until then I hope you enjoy my little reminder of what awaits you at the shore – click onto the image for a larger size. PLEASE DON’T TAKE MY IMAGES!! MY ART IS COPYRIGHTED. 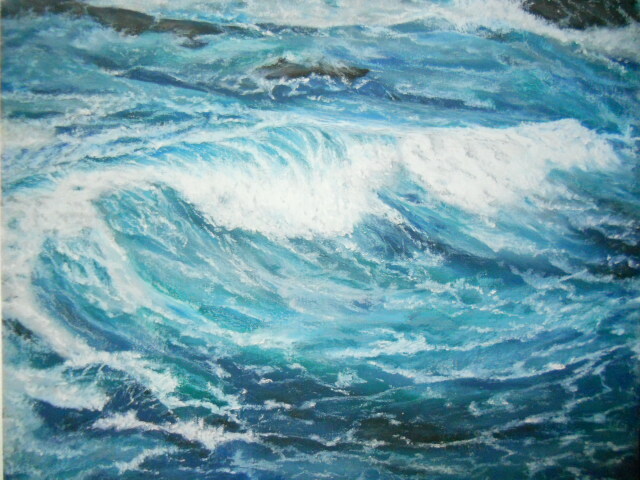 This entry was posted in Drawings and tagged art, Crashing wave, drawing, fine art, graphite, Sea, sea foam, spray, wave. Bookmark the permalink. Love it all, keep it up! Thank you for taking time to review my work, that means a lot. Love seeing your latest and hope you post more of your paintings! I’m just back from an holiday trip to South Italy. We were on an island (Ischia) and last week end there has been a strong storm. As consequence next day the sea was very rough and the waves reminded me of your drawing. What can I add? only…wow! Thank you so much Tom – I really appreciate hearing from you. Wonderful sense of movement. Exciting pieces, Mary. Thank you Jane, I’m glad you enjoyed the drawing. Wow, awesome. You captured the majesty of the waves perfectly. Thank you Brenda – something very intriguing about the power of the sea! Absolutely life changing to see the sea in tumult. Magnificent drawing! With only pencils you make wonderful things! Thank you Dsaquarelles – really appreciate your nice comment! You can actually feel and see the movement in the water! Fantastic! Thanks so much Elizabeth – love your reaction to the scene. Anytime you can feel the sea through my work, well that is an incredible compliment. Thank you again – hope you have a great week ahead! Hi Maniparna, thank you for your generous comment and reaction to the scene – it was a great one to work out with the pencils. John had a good question, isn’t it interesting to see how similar and different our two creative outlets are. Ooooh…. I can feel the sea breeze and hear the sound of the waves pounding the shore! Lovely rendering Mary….. as always. Thanks so much Dorann – no greater compliment to know the drawing touched you so. Hope you have a wonderful week ahead! Mary, you know already how I love your seascapes, but this one leaves me breathless! It is as if the sea itself drew it. Hi Patricia, thank you for your beautiful comment and compliment. It’s great to hear from you and glad you enjoyed the sea in pencil! The ocean in grisaille. Grisaille is an art term meaning beautifully effervescent (no it isn’t–but it could easily have been if the French had been paying attention). I think you are so right Prospero – there is something extraordinarily beautiful and sometimes elegant in various ranges of gray. Too bad for the earlier French artists and critics. But I love your reaction, thank you! Wonderful feeling of movement and fluidity. Water will always be your best element, you mastered it exceptionally to the point of perfect perfection. There is such a powerful, attractive force pulling us into the dynamics of this liquid element that is hard not to have an emotional reaction to it. The way you move, flow and immerse yourself with your tools is mirroring back straight into our minds and makes us move as one with the waves and that is remarkable to say the least! Thanks Rita. It was a really neat wave to develop using graphite, especially the area of transparency. You and me both miss the power of the sea! Thank you so much – fluid is what I was after, I so appreciate your description! Awesome! I can hear the gulls and waves crash. Flowers can wait for another day. Thanks so much Susan! Your comment has sparked something and hopefully I can pull it off – thanks again! Oh I’m so glad to read your reaction Theadora, makes my day. I hope you stay awhile and take in the fast moving and crashing waves – could get a bit chilly out there. Ah the sea lions were rather shy this day, but not too worry they will be sunning up on the rock in no time. Oh what a magnificent lighthouse – truly one to see! So glad you enjoyed yoru retreat my friend. Well, I’m looking forward to a sea lion portrait or landscape with a cameo! My feathered, winged feet are crossed. Enjoy the weekend, Mary! This is incredible – it’s so dynamic. I can feel the wind tugging at my jacket, and the salty spray on my face. Wonderful! Thank you Antonia – the wave was such a great subject to draw out. I was surprised to get the translucency with the graphite. Awesome Ramaink – such a compliment and much appreciated! Thank you so much Marina – it was a most enjoyable scene to work out with graphite. I love how you’ve somehow expressed the sea spray, foam and their movement. Thank you so much – really appreciate your thoughts!! Ah, Old Briny! Can’t wait to disgrace myself by rolling up my jeans to splash and leap in the rollicking, revelling summer waves! Love the drawing, Mary. Your way with graphite is sublime, Mary. I love your description my friend! Thank You Derrick for the great compliment – when a viewer can connect to my work in feelings or movement, well it gets no better! Mary – you just get ever better. I admire the way you use your descriptions to provide teaching points to those wanting to learn the medium. Thank you for your very generous and thoughtful comment. I’m glad you enjoyed the drawing process for this scene – I learned through others and am only too happy to pass on aspects that I hope others might use. Thanks again! “I must go down to the seas again, to the lonely sea and the sky.” 🙂 Love this one, Mary. Brilliant drawing. Thanks very much Sylvia – the sea and all its is an amazing subject to capture with the pencil. Lovely work, well done Mary. You know your sea – you capture the most amazing shots! Thank you so much! I enjoy hearing “how you do it” and seeing your wonderfully realistic and artistic result. Success! Thank you so much Cynthia and glad you enjoyed reading about the process! Mary, such stunning work! It doesn’t matter which medium you choose, the result is spectacular, particularly as Debi said, with seascapes. I can almost feel the wind in my hair, so amazing is your rendering. Bravo, my friend! Thanks very much Laura, you are always so generous and enthusiastic in your response to my work – means a lot. A very big compliment when someone can feel the subject, in this case the wave – a big thanks to you!! Wonderful drawing Mary! We can feel the wave breaking. Thank you Trini, I really appreciate your kind response to the piece. build the water and foamy spray… to bring the motions of the ocean waves, truly amazing! Thank you, Mary for sharing this beautiful drawing and taking time to explain the layers of detail process. Thanks Amy for your thoughtful response – there is something very exciting and relaxing when drawing the sea, I can feel the energy of the water. I’m never sure if people are interested in reading about my process, so I really appreciate that you mentioned it. Ah, waves are my weakness. Something I definitely struggle with in the art world. Great job! Hi Cheating w/death, thank you and nice to hear from you. Appreciate where you are coming from – waves maybe a challenge, but I’m sure you’ll take them on. Please let me know if you want a few suggestions on books that I found and still find invaluable for painting/drawing the sea. Thanks again, I really appreciate. Thank you Resa for your generous feedback. As you feel the material with thread and needle when creating your gorgeous gowns, I feel the waves and energy of the water – it’s what guides me when drawing the sea. Very cool with the similarities don’t you think? Thank you so much Janet – the movement is what I feel when I draw or paint the sea. It’s one of the “ah” moments. Have a wonderful evening. You do it so well…I remember your talking about this after making an acrylic painting of the waves….the wonderful “ah” moment….may there be many more…janet. Like the runners’ endorphin rush – exactly and this drawing had many of those. Very cool, but you never know when it will occur, time to connect to another scene!! Have a beautiful weekend my friend! That is fantastic Cynthia – I love it and what an amazing compliment – the line is perfect “the flung spray and blown spume,” John Masefield knew his sea. It gets no better, thank you my friend – you’ve made my evening. Wow! This is wonderful, Mary. It looks so real. Great job! Thanks Jill – I really appreciate your reaction! Thank you so much Debi and for your generous feedback. I really can’t way, except there has always been a pull toward large bodies of water, the ocean in particular. Nothing like watching the sea whether it was when I lived in San Francisco or Maine – no matter it became fascinating to me to watch. Love capturing the motion on paper or canvas – thank you!! Such creative, interesting detail, love the image you created. Really nice work, amazing depth of field. Do you use a tool to determine a specific color range as with photography? Such as an RGB or Hex chart? Thanks very much John! Great question. I go into microsoft editor Photo Gallery and will make the photograph B&W and then play with the options for contrast and value ranges until it screams that’s it. Then it becomes my own drawing, from sketching to working those pencils for appropriate value ranges. Glad you enjoyed the piece! Interesting, I had no idea about this, it was a hunch. Amazing the similarities then, in the two forms of visual expression. I’m hoping I explained this correctly. The drawing here is an actual drawing from start to finish – the work I do on the computer is to the original reference image. As in this case it was a colored photograph of a full blown wave coming ashore and by cropping that reference image and changing it to B&W gave me a starting point to actually draw on paper ( with the graphite pencils) what I envisioned the scene to be, based off of what I did to the reference image. I hope that makes sense – what you see here is not a digitally enhanced image of the original reference but rather an actual drawing. Glad you enjoyed it John!